An egg mask is very useful in skin care for many reasons. 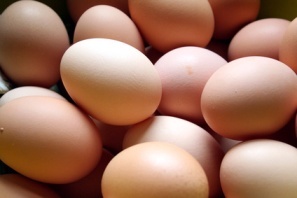 Eggs are protein, vitamin, and mineral rich to nourish the skin. Egg whites are useful in skin cleansing and exfoliation. Eggs are also excellent for skin tightening and therefore are a popular ingredient in natural facial mask recipes. Beat the egg in a small bowl. Add the coconut oil and honey slowly and beat the mixture until it is the consistency of mayonnaise. Spoon the mixture into a cardboard toilet paper roll that is sitting upright in a small bowl. Set in the freezer overnight. To use, peel away the top of the cardboard roll and smooth the frozen stick over the face. Leave it on for 5 to 10 minutes, then wash off with warm water. Keep the stick covered with plastic wrap and freeze between uses. Beat the egg yolk until fluffy. Add milk and avocado, mixing thoroughly with the yolk. Apply to the face and leave on for 15 to 20 minutes. Rinse off with hot water. Take one beaten egg yolk and apply it liberally to the face with a cotton ball. Let it dry on the skin for 15 minutes and then rinse off with cool water. This egg mask will replenish the skin and tighten up the skin pores. Mix all of the ingredients together until the mixture is creamy and well blended. Spread the mask mixture onto the face and neck. Leave it on for fifteen minutes and then rinse off with cool water and pat the skin dry with a clean towel. Mash the ripe peach to a pulp or purée it in a blender. Beat the egg white until stiff and then fold the peach purée into the egg white. Apply a thick layer to the face and neck with the fingertips. Let it dry on the skin for 15 to 20 minutes and then rinse off with lukewarm water. Mix all of the ingredients gently together and let them stand until the paste reaches room temperature. Smooth the egg mask onto a clean face and lie down for 20 minutes. Rinse off with tepid water. Mix the ingredients together and then apply the mixture to the face and neck areas. Leave it on the skin for 20 minutes and then rinse off with warm water.